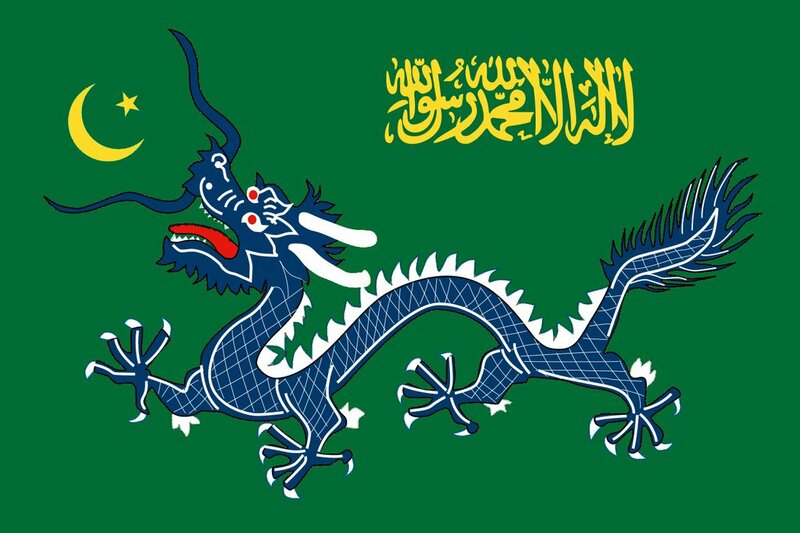 This is a flag created by Arthur Drakoni from Deviant Art for an alternate history China where China was ruled by Chinese Muslim rulers for a long time. Even though Muslims are still a minority in this alternate world they are thoroughly Chinese and have become integral to the Chinese identity. I have made this Islamic China flag inspired by Toixstory’s The Grand War map. In Tioxstory’s own words: This is the world in a universe that diverged from our own in the year 876, with the death of Huang Cho during his rebellion before he could kill one hundred thousand rich Muslims in southern China. Without their deaths, Islam continued to grow in China during the centuries, especially among the rich merchant classes. Eventually, after a brutal series of civil wars, an Islamic dynasty came to power in Hangchow, and would rule China from the late 15th century until the current year, 1894. While most of China still practices Buddhism, Confucianism, and other religions, the Islamic rulers have adapted themselves to Chinese culture and customs well enough that they are accepted as rulers of China, much like the Manchu of our own world. Muslim Chinese are a growing minority group, however, especially as many of the rich at least pay tribute to being Muslim, if only for the sake of political power. As a muslim I am very happy to hear that but very hard to believe as there is no written evidence to support. Would be good if someone could do research and complement the story with facts. I am very interested to follow this story. BTW many in Singapore still consider Muslims being Malai (or Malay) they still don’t have the knowledge that in China the Muslims are not called Malai but Mus se lin and they are also not Malay by race just like the Hui min, Uighur and many others. In Singapore and Malaysia almost all Malays are Muslims but in Indonesia they also have Malays who are Hindus, Buddhists and Christians. Only 91% of the 220 million people in Indonesia are Muslims. It would be good if we could correct this wrong perceptions.. Ask the uyghur if they are thoroughly Chinese, having their nation occupied and identity suppressed. Kazan, The Uyghur nation is the Chinese nation, a few separatists do not constitute “suppression”. Only in your ignorance are uyghurs Chinese, they are Turkic as I am. Give them a choice and see if they want to remain part of China, see if they want to speak mandarin over uyghurs, see if they want to eat Chinese over uyghurs and see if they want to behave Chinese over uyghurs. Han Chinese are different in every way language, culture and ethnicity. By your standards China is part of the Japanese empire.